Carpet Tile Tackifier Adhesive also known as 'low tack' adhesive is a liquid form of double sided tape used to fit loose lay carpet tiles. Perfect for larger areas it offers a cost effective/labour saving alternative to double sided tape. This off white liquid similar to PVA glue, dries to a clear film and can be applied to any wooden or concrete subfloor. Once the tiles are laid it stops any lateral movement, so ideal for high traffic areas or public spaces where safety is paramount. If required the tiles can be easily lifted for cleaning or replacement without the acquisition of more adhesive. Most manufacturers recommend using in areas over 25 square metres (100 tiles). 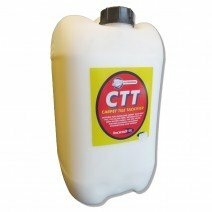 We usually stock both the 5 litre and 25 litre tubs. Please click on 'More Details' below for information on coverage, application and storage etc. Firstly when considering using the carpet tile tackifier adhesive you need to make sure the surface you are laying on to is clean, sound and free from dirt and dust. In the past we’ve found the easiest way is to run a vacuum over the floor to ensure no particles are left behind. This adhesive can be laid on any wooden or concrete subfloor and needs to go from white to transparent before fitting the carpet tiles. The drying time can vary depending on the temperature of the room and time of year. We recommend you read the instructions on the back of the product before starting but we will also give you a few handy tips below which will help make the process even easier. The manufacturers Bond-It advise using a roller or brush to apply the adhesive to the floor. However we have very successfully used an odd piece of carpet tile about 12.5cm wide x 25cm long as a flat edged scraper to spread out the liquid. You need to spread the adhesive out thinly so just enough to cover the floor. Remember, the more adhesive you put on the floor the longer the drying time will be. If you do use a roller attached to a broom handle to cover really large areas then take care not to spray adhesive up the walls and skirting boards. In some cases we have heard that at a later date dust has gathered to the errant spray left behind and dots have appeared on walls etc. Of course as this adhesive is water based then marks can be cleaned up afterwards with a damp cloth but easier to avoid in the first place if possible. We are often asked how to lay this carpet tile tackifier adhesive as there can be confusion as to how much of the floor you glue at a time. We have found that doing a whole room in one go is best, that way you only have one drying time to endure. Working your way from the corners back through and out of a doorway is ideal, all the time making sure you do not walk on the adhesive that you have just put down as it will peel up on the bottom of boots and shoes. Then before entering the room again, open up a pack of tiles and place a few like stepping stones to get to the middle of the room. You should already have marked a cross on the centre so you know where to start. Then by building up your floor from the centre out with whole tiles, you should be left with only the cuts around the outside edge. The carpet tiles which you have simply put down as stepping stones can be easily lifted and re-positioned with the directional arrows underneath the correct way. Please see our Fitting Guide for help and advice on how to lay your carpet tiles the easiest way. This five step guide has been created to make the process simple for a DIY handy person. We have included images too taken along the way to ensure you are on the right path. 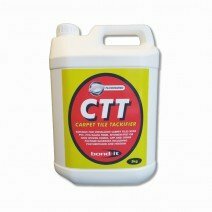 This tackifier solution is the perfect adhesive to use in all manner of environments and has even been proven to increase the overall life of your carpet tiles. Please note that the 25 litre tub of tackifier is quite heavy at 25 kilos and can be a little awkward to tip on the floor. Particular care should be taken when doing so but we appreciate that there is a discount to be had compared to the smaller 5 litre tubs which cost a few pounds more. We’ve had feedback from our customers to say when doing several rooms they would purposely buy 5 of the 5 litre tubs simply because they were easier to handle and manoeuvre compared to the 25 litre tub.